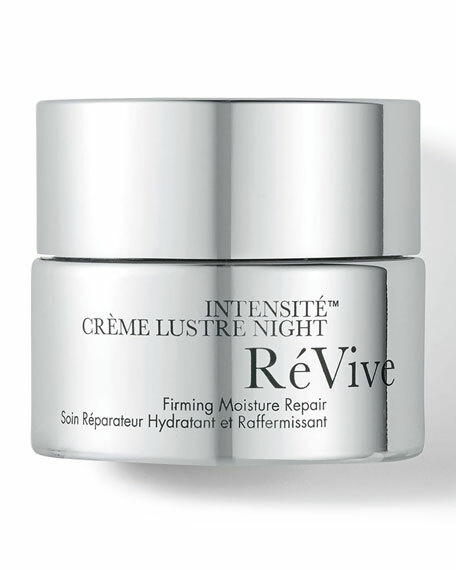 ReVive Intensité Crème Lustre Night Firming Moisture Repair, 1.7oz. ReViveIntensité Crème Lustre Night Firming Moisture Repair, 1.7oz. Powered by RES Technology. Restorative Firming Complex, this intensive nighttime moisturizer helps dramatically and visibly increase firmness and elasticity for stronger and more resilient-looking skin. Skin is visibly lifted and contoured for a more youthful look and a reduced appearance of wrinkles. This scientifically advanced formula deeply hydrates, rejuvenates and restores the look of skin to unveil a brighter, luminous, healthy-looking complexion. For dry to very dry skin with loss of elasticity. Apply nightly after cleanser, toner and serum.